As classrooms become more connected with digital tools, the shift from “students as consumers of content” to “students as creators with content” becomes necessary. Without this shift, your technology just becomes an expensive replacement of a pencil, paper, and textbook. 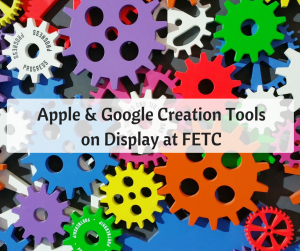 This year, FETC has many great resources that are being highlighted as student creation tools, but I would like to focus on a few resources that were showcased by Apple for Education and Google Certified Trainer Matt Miller of Ditch that Textbook. Clips by Apple for iPhone and iPad – Clips is a relatively new video production tool released by Apple. It does have a social media feel to it. In my opinion, it is as powerful as iMovie, but so simple a Kindergarten student could master it! Sounds too good to be true right? It almost is. There are several things that Clips lets you do: add graphics, camera roll images, manipulate text, use stickers, add free music, and use filters. The piece I’m most excited about it is the Live Titles text feature. As the video records, the words being said are placed on the screen. It is like an automatic closed caption option. This could be a powerful creation tool for your students to use to display their understanding of the content that they have learned in your classroom. If you are at FETC this year and have a chance to go to a Matt Miller session, DO IT! I had the pleasure of attending a session of his called G Suite Creation Station: Creating, Not Consuming, with Google Tools. Matt walked through several uses for Google Slides and Google Drawings. I personally think Google Drawings may be one of the most under utilized tools in the Suite. Annotate/Caption This! – With Google Drawings, students add captions, speech bubbles, and other text to photos, historical documents, artwork, or other artifacts. This could quickly be brought to higher levels of DOK or Blooms as students describe how they understand why subjects in a picture are behaving in a certain way, or why they believe specific items were added to historical documents. The options are endless. 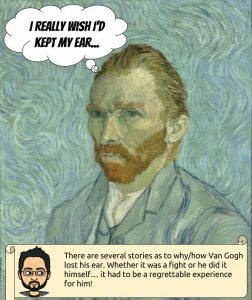 Comic Strips – Another iteration of the annotate/caption this application of Google Drawings. Students create comic strip style pages of a sequence of events or stories that they have studied. Infographics with the Noun Project Icons – Infographics are becoming more and more popular, and your students want to make them. Have them show their steps to solving problems or display data they have collected. Using free icons from thenounproject.com makes it a quick and easy project for your students to do. Check out a couple of examples I made during Matt’s session, and click the following link to see the rest of Matt Miller’s G Suite Student Creation Station Ideas!